Tour the bumpy track when Thomas delivers a picnic surprise of bubbling lemony treat to everyone! The fun adventures continue when Thomas and Percy play a fun game of hide-and-seek while trying to get all their work done too! Cheer on the Sodor football team with Emily, and make sure you save room for cake because Mr. Bubbles the clown prepared a showstopper of a picnic. This Thomas is fun - but we always love Thomas around here! *Follow me @jamaise at Twitter & Tweet this : RT @jamaise #GIVEAWAY #WIN - A copy of Thomas & Friends:Pop Goes Thomas on DVD http://bit.ly/gQBBq2 ends3/14 tweet each day for one entry each ! I follow your blog. My nephew is a fan of Thomas & Friends. I'd like to win this for him. Thanks. I follow your blog and my son LOVES Thomas & Friends. His favorite is Thomas & Percy! I like how thomas quietly teaches kids lessons. My two boys love Thomas and Friends and we also follow you publicly. Our favorite character is James. We LOVE Thomas and I am a friend of yours on GFC! 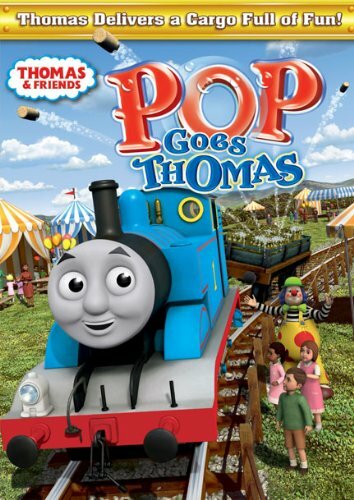 I love Thomas and Friends. My boys loved it and now my nephews love it. Thomas is such a great teacher for kids. We love his movies.